The story told in this book was born almost by accident, roughly around 1998, when Paul Doornbusch, Australian composer and expert in computer music, reading of the death of Trevor Pearcey discovers that the computer CSIRAC, designed by him, not only appeared to be among the first digital computers in the world, but it had been used in 1951, as the CSIR Mk1, to compose some musical melodies. Paul Doornbusch, like most of those interested in computer music, thought that the first stirrings of computer music had arrived from the Bell Labs in the United States, thanks to the experiments performed by Max Mathews in 1957 on his first Music N .
The idea that anyone in Australia, could anticipate for a few years the US research was presented as a real lighting. That’s because from that moment Paul Doornbusch started a survey work that enabled him first to reconstruct the facts of that history, remained hidden for almost half a century, and then to undertake, in collaboration with others, a work of recovery of the music made in Australia in the late forties and the mid-sixties, between Sydney and Melbourne. A preview of all the work was presented by the author in 2004 with an article in the Computer Music Journal, Computer Sound Synthesis in 1951: The Music of CSIRAC, which you can read here or at the bottom of this article. The following year, Doornbusch expands this article and derives from it the book reviewed here. The fact that for a long time, and even today, the collective name associated with the first experiments of digital synthesis of sound was that of Max Mathews, tells us that the historical contribution of this survey is very important in order to obtain a realistic overview of what happened in the fifties. Because if there is no doubt in considering Max Mathews as the father of computer music, to which we should support the name Lejaren Hiller, it is equally true that the story told by Doornbusch off to the United States the primacy of the first digital synthesis of sounds in the history. I will not go into the detail of the events recounted in this book, since I’m already preparing an article on the history of CSIRAC I will publish soon, but at least I would like to highlight that the author covers every stage of the various experiments conducted in Australia, analyzing the features and comparing the data that allowed us to date the music of CSIRAC as earlier than made up in Europe with the Ferranti Mark I, again in 1951, and the United States by Max Mathews. There is something else that binds CSIRAC latter and his Music N. During the second lifecycle of the CSIRAC, in Melbourne, was even developed a program for performing music, the Music Programme, which presented some similarities with the Music I of Max Mathews, but stand out despite the potential for much more limited. 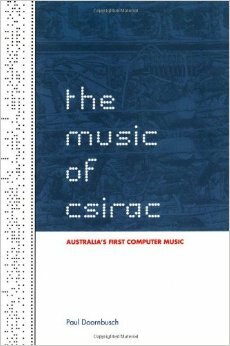 However it is important to highlight that, beyond the banality – if an end in itself – to determine who and where he created the first digital sounds or who developed the first music software, which prevented the Australian experimentation to achieve the fame of the activities conducted in the United States, was the lack of continuity of the whole project of computer music, a fact that this activity shares with other pioneering experiences of computer music, of which I will write soon. I conclude signaling that to integration of the literary part, the volume also contains a CD consists of two parts: the first musical, containing all tracks compounds with CSIRAC both during the years of Sidney that during those of Melbourne, while the second part is a track for the computer containing an interview with Trevor Pearcey and a slide of photos, which I post below. Those interested can purchase the book, as I have done, contact the author. I really want to thank Paul Doornbusch for the kindness and availability. The address is here. If you want to read for free the paper Computer Sound Synthesis in 1951: The Music of CSIRAC, which Paul Doornbusch published on Computer Music Journal, and that basically serves as a summary of the book, please follow this link.